To promote market awareness and safe use of LIFT products. 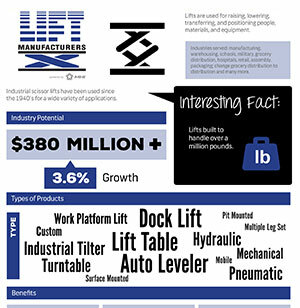 Lift Manufacturers members meet regularly to review, discuss and revise the standards for design, performance and proper operation of scissor lift tables, tilt tables, and turn tables. The development and promotion of industry standards for the design, performance and proper operation of lifts and lift systems. The development and promotion of Safety, Training, Inspection and Maintenance recommendations that are available to all lift users. The preparation and distribution of educational and promotional materials as to the benefits of LIFT solutions. These documents area excerpts from the MH29.1 standard that is available for purchase. The Material Handling Education Foundation, Inc. has awarded the $1,500 Lift Manufacturers Honor Scholarship to Hosseinali Salemi at Oklahoma State University. Hosseinali is a PhD student majoring in Industrial Engineering with a concentration in Supply Chain and Network Optimization. He has always been impressed with the transformation of raw materials into finished goods or services. His current project is working on optimizing the supply chain of a food company in the United States. After graduation, he would like to stay in academia and teach.